I didn’t realize how traumatic it would be to prepare for taking a 7-day cruise. How many changes of clothes for different “occasions” I should have been prepared for!! Hell, I live in scrubs! I really didn’t think a bathing suit, a couple of pairs of shorts and shirts was unreasonable. I ended up with not just shorts and shirts, but two dress outfits, sandals, sneakers, and dress shoes! Certainly more than my gypsy soul had bargained for. One other decision she was right about was our cameras. I’ve had the same Pentax film camera, on many road trips, since around 1984 and she’s still strong. Try as I might, I’ve lost two good digital cameras to the ocean in about four years. This time we decided I would leave my good camera on the ship and we purchased a 10mp, waterproof to nine feet, Nikon digital camera that worked like a dream! With our final duffel packed we loaded everything in the car and set off on the 3-hour drive to Galveston. They started boarding around 2:00pm and it was like watching a herd of sheep shuffling through a chute. Except for one thing, very few of these “sheep” seem to have looked in the mirror before they left their house. I really enjoy “people watching” and this was definitely the stage! From bright multi-colored Hawaiian shirts on AARP members to the family in button down Oxford shirts, with the young girl dressed all in black, right down to her fingernail polish, with the Olivia Newton John sweat band on her head. (We’ll meet her again later). It took about 45 minutes to make our way along the tortuous gangway and onto the ship. 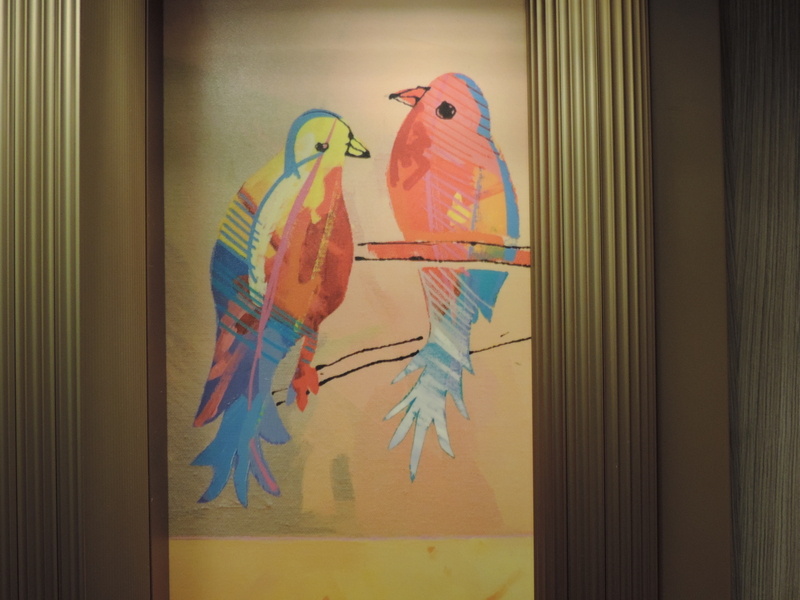 We made our way up to our room, beautifully marked with a pair of parrots painted on the door. Every door was decorated differently, perhaps to ensure accuracy when coming home “in the dark”. The room was simple and efficient. Two twin beds pushed together to make a Queen, a loveseat, dresser, desk, closet, and bathroom. I don’t know that I ever got used to (remembered) the 3-inch step up into the bathroom. I tried not to be vocal. By far the nicest part of the room, for me, was the balcony. Plenty of room for me and two chairs. 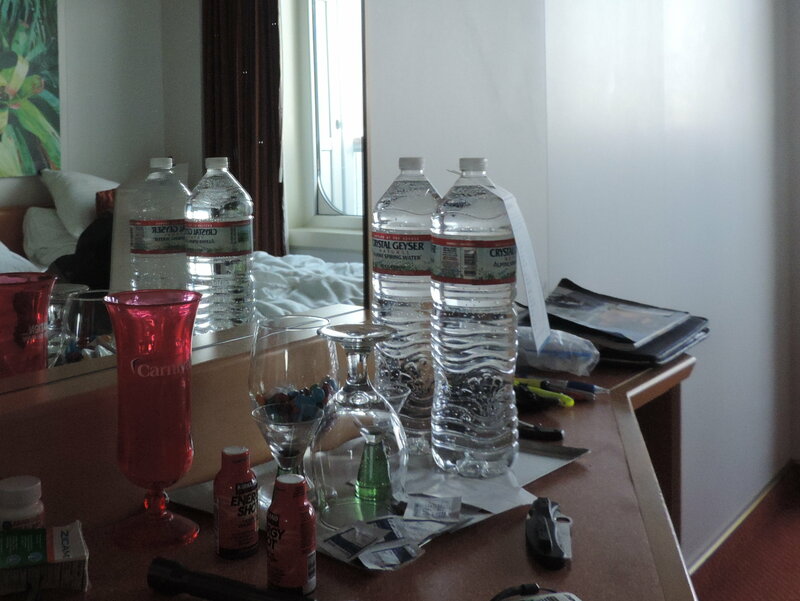 Although there was no ice in the room, thankfully there were two bottles of water on the dresser and I was parched! I downed one and took the other exploring. There are many things I learned on this trip but pertinent now, I will always pay extra for a balcony room, and I will always arrange for a 7-day cruise rather than 5. The latter simply because with both of us coming off long shifts and being strung out, that first day on the ship was almost useless as we napped, ate, and napped again. That would chop at least a day off a five-day cruise. So nap we did until it was time for our reserved 7:00 dinner seating in the Southern Lights dining room. It was assigned seating so although we had our own table, we sat next to the same couples for the entire cruise. Not so much that you were in each others laps but you could laugh and talk if you chose. I learned later that they put at least 10,000 plates a day through those dining rooms and I was wrong. Until the day we left he never slipped up on our names. Food. Let me take a paragraph or two to talk about this. Our sit down (nice clothes…Thanks Stacy) meal was scheduled at 7:00pm. This was with Suwit at a table for two in the Southern Lights dining room, they also have a Northern lights dining room and both have two seating per night. You selected a beverage of choice, and then an appetizer. Once that was done you selected an entrée from a list of 5 or 6 things. You were never rushed, but once you were done you were welcome to dessert…or another entrée!! I knew I was going to have to watch myself because most entrees, although portioned small, were definitely a treat at home. Caesar salad, Flat Iron Steak, Chicken Breast or Fried Chicken? Oh, I mis-spoke, that’s the “everyday menu”. Here’s some of the daily specials. Hint, it helps if you read them like an auctioneer. Strawberry Bisque, Key Lime Pie, Sugar Free Apple Pie, Grand Mariner souffle, Warm Chocolate Melting Cake (there were ladies that showed their teeth for the chocolate cake), and Bread Pudding. Now mind you, this was the dinner seatings. Food on the Lido deck started in the morning. Buffett style was all your basic breakfast fare including fresh fruits, breads, meats cereals, and specialty omelets with eggs, egg whites, and nothing or all of almost any stuffing you could think of! Around 11:00 the Lido deck came to life again and lasted throughout the day. On either end was a Mongolian Wok, fresh pizza made to order, burger grill, carving and deli station, burrito and pasts bars. In the center was a massive salad bar, a chilled section with sashimi, sushi crab legs and chilled shrimp. If you chose to “splurge” (I couldn’t see how), on the next deck up there was a Prime Steakhouse on one end and Cucina del Capitano (Italian) on the other side. Although with all this other high-end food, we never did explore this avenue. After dinner we cried Uncle and went back to our room to fall into bed. I don’t think either of us saw 10:00 that night and breakfast was lunch the next day. We spent most of the next day walking the decks and looking at shops. There were photographers everywhere and different backdrops to create virtually any setting you could imagine. We had fun with some of these. I was embarrassed but all went well. In fact we all ended up sitting in the hot tub (one of 5 or 6) later that afternoon. We had seen the sign for the Spa in our travels and back in the room we talked about it. We tossed it back and forth and then both laughing agreed, whatever the cost, my old boss was paying for this with all that vacation time he didn’t give me! Wow! Neither one of us really says “Let’s go” without checking all the boxes first. I’m definitely NOT a Newport Rockefeller. Let’s just say that we did the hot stone massage (they even massaged our ears!!) that left us both like limp noodles. We had a consult later where they tried to push this detox for weight loss and told us that we needed to “exercise and stretch” more. Jeez, all this for $300 plus tip!!! We sat outside and watched some nameless movie on a huge outdoor movie screen above a pool until dinner. Dinner tonight for me was: wilted spinach and mushrooms followed by sweet and sour shrimp and Saint Louis spare ribs. The more elegant half of the party went with: black bean soup followed by grilled tiger shrimp and that warm chocolate melting cake. After dinner we wandered through the decks and shops again, looking at all the displayed pictures taken that day that you could purchase. We ended up at a piano bar on one of the upper decks listening to ‘Bob’ in a fedora play Billy Joel songs and other requests. We also made friends there with a Cambodian bartender named Sassi (and about 26 other letters) who we enjoyed talking with for the rest of the cruise. We decided to act our age and turn in “early” as we were due to dock in Montego Bay, Jamaica around 10:00 the next morning.